Sally Run: Let it snow, let it sleet, let it rain! It's our 6th snow day of the school year, and winter doesn't even really begin until next Tuesday - that can't be a good sign! We woke up to a beautiful fresh blanket - several inches of perfect snow still falling - but it has now changed to that fun, frozen, pelting -you- in -the - face stuff that makes every move dangerous! I woke up with visions of riding Barney in the snow, but he refuses to even lift his head above his knees - he looks like a peanut pusher with his nose shuffling along the ground, hiding from the falling ice! He actually tries to bury his head in my back and walk behind me to block the weather - um, hello, have you seen how big you are? At literally twelve times my size, I don't think it's working out for him very well! So, it's another day of defrosting water troughs and trying to keep everyone warm and dry, but at least the kids are loving being home, and humans and horses alike are thankful for the new run-in sheds!! This just in: Meagan Davis and Bentley were 6th out of 14 at the Young Rider World Cup today! Top 7 advance to the freestyle after indiv. test tomorrow. Do you remember her unbelievable ride when Bentley freaked at Nationals? 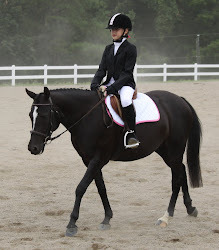 I have a video of her from about a year and a half ago, and it is AMAZING how much she has grown as a rider in that time! I love watching our awesome young riders! Way to go Meagan and Team USA!